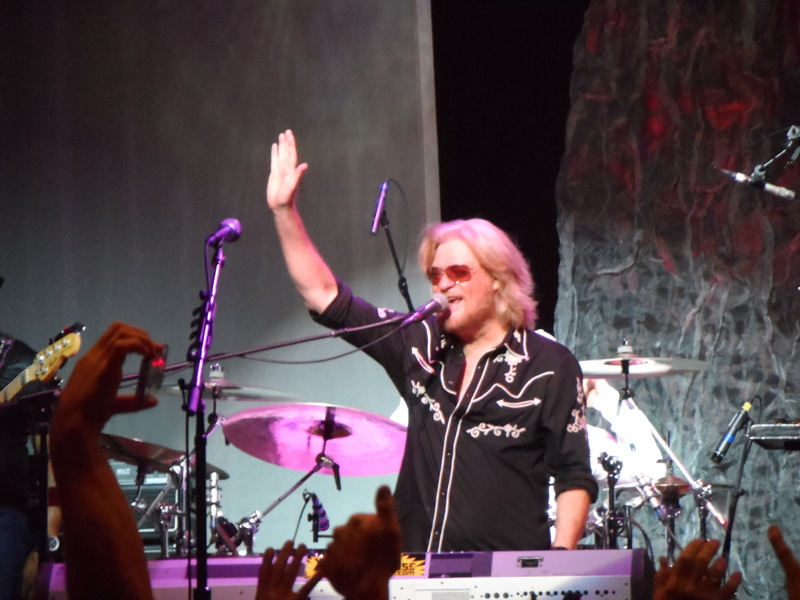 This is a file shot of Daryl Hall during a 2014 Hall & Oates performance at the Borgata Hotel and Casino in Atlantic City. We know what we’re going to get at a Hall & Oates concert. All those classic and timeless hits, the ones that sound as good today as they did in the 1970s and 1980s. There are no complaints with that. What we don’t usually hear from Hall & Oates, though, are lesser hits or deep album cuts from the vast catalog of their careers. For that, one has to attend a solo show by either of the Rock and Roll Hall of Famers. John Oates will tell his audiences up front that if you want to hear the greatest hits of Hall & Oates, then you should go to a Hall & Oates show. The thing is, if you go to a solo Oates show, you appreciate the stuff that’s strictly Oates because you don’t get to hear it as much in concert. The real treats are the deep album cuts, or in Oates’ case, the new solo stuff. Inevitably though, you can’t help but miss Hall’s presence on a song or two. It was the same thing on the final day of 2014 when “Live From Daryl’s House” presented “Daryl’s Rock ’n’ Soul New Year’s Eve,” live-streamed exclusively online at Stageit. For $5 – and when was the last time a concert ticket was that price – one could buy an online ticket, log into Stageit, and see Daryl Hall and his band perform at the new and recently opened “Daryl’s House” in Pawling, New York. That’s the next best thing to actually being at the concert. One can grab a cocktail in the comfort of one’s own family room, slap on the headphones, turn it up, and rock some Hall & Oates. Mostly Hall, this time. And why not? It’s his house. Hall didn’t disappoint, but he rarely does. It wasn’t a stretch to want to hear Oates on a couple of the numbers, but the real treat was the handful of deep cuts Hall performed. “Dreamtime,” from Hall’s 1986 second solo album “Three Hearts in the Happy Ending Machine,” was outstanding. Hall also pulled out two cuts from his first solo album in 1980, “Sacred Songs” – “Don’t Leave Me Alone With Her” and “Babs and Babs” – the latter of which was a unique but refreshing choice for his first encore. Hall & Oates fans will recall that the “Sacred Songs” album was deemed not commercial enough by RCA Records in 1977 because it was so different than what Hall & Oates had produced to that point. That and the fact that record officials didn’t believe the album contained a hit single and feared that the record might alienate mainstream fans kept the album on the shelf for three years. It was eventually released in 1980. For the first time that I can recall, Hall didn’t perform “She’s Gone” at a live show. Off the 1973 “Abandoned Luncheonette” album, it’s been a staple at every Hall & Oates show, every solo Oates show and every solo Hall show that I’ve seen. As if opening the curtain on a new year with Daryl Hall from the comfort of one’s own home wasn’t enough, the online show delivered even more than that. Philly native Mutlu, a frequent opener for Hall & Oates for several years now and the current generation of Philly soul, did a killer 12-song set to kick things off. He’s got a sweet voice and stage presence. While his original songs are outstanding, he’s just as good on covers, especially Van Morrison’s “Crazy Love.” If you’re a Hall & Oates fan, you can’t help but like him. Check his stuff out at www.mutlusounds.com. In addition, after Daryl had packed it in for the evening, his band hung around and played well into the night, offering great versions of some Philly soul classics, among them “TSOP” (The Sound of Philadelphia), which you know as the theme song of the television show “Soul Train”; and “Backstabbers” by The O’Jay’s, another of the early hitmaking groups for Philadelphia International Records in the 1970s. Nice finishing touches on a great show, especially for those of us who live in Philly and have a special place in our hearts for the Sound of Philadelphia. All one had to do though was hit refresh or log out and log back in and the problem seemed to correct itself. It was annoying, and it happened to me three or four times, but I was only offline for a few moments and missed only a portion of a few songs. The event had the added appeal of being for a good cause. Fifty percent of the proceeds from the online ticket sales were donated to City of Hope, a leading research and treatment center for cancer, diabetes and other life-threatening diseases. All of that for only $5. On the final day of 2014, Daryl Hall won the Internet. I enjoyed this show from my living room in IL. For $10 (it was a pay what you’d like show) it was incredible, and I hope DH has more Stageit shows from his new place. Although I could not get my ‘smart’ Samsung TV to stream the show, an HDMI cable from my mac to another TV saved the night; I had an uninterrupted stream all night, it was wonderful. Enjoyed the opening act, and hope to catch Mutlu and H&O when I’m back East. I won’t be back in time to catch Mutlu at the Tin Angel in Philly, but is one of my very favorite intimate venues. I enjoy seeing shows at the Tin Angel in Philly as well, Carole. You’re right, it is an intimate venue. Of the many times I’ve seen Mutlu perform, one of those was at the Tin Angel. Good idea on the replay, Lindy. I wonder if Stageit would allow Daryl to do so, of if he even needs permission to replay it on his own site. I’d love to see a replay!! Now he had done Method, that would have been a rockin New Years! I was at the show and it was a load of fun. Daryl’s voice was great. The band was hot. It was aperfect way to greet the new year. I’m thinking the only way the concert could have been better than it was online was if one was there in person, David. I’ll add my voice to asking for a replay. Missed in on NYE. Love Daryl Hall! I wish I would’ve known about Daryl’s Club House sooner…I would’ve loved to have treated our youngest son, a 32 year old Coastie, to supper there, when we were in NY for his first NYC Marathon Run..as an early bday gift..He grew up listening to the best..He would’ve loved it. A re-airing of this would be nice.